Two Lehigh Valley community members have made a major donation to support the men and women working on the ground at Musikfest. BETHLEHEM, Pa. (WPVI) -- Two Lehigh Valley community members have made a major donation to support the men and women working on the ground at Musikfest. Jim Stocklas, an original volunteer at the first Musikfest, and Barry Bartakovits donated $10,000 in Musikfest Food and Beverage Tickets to the City of Bethlehem's Emergency Response Management division. 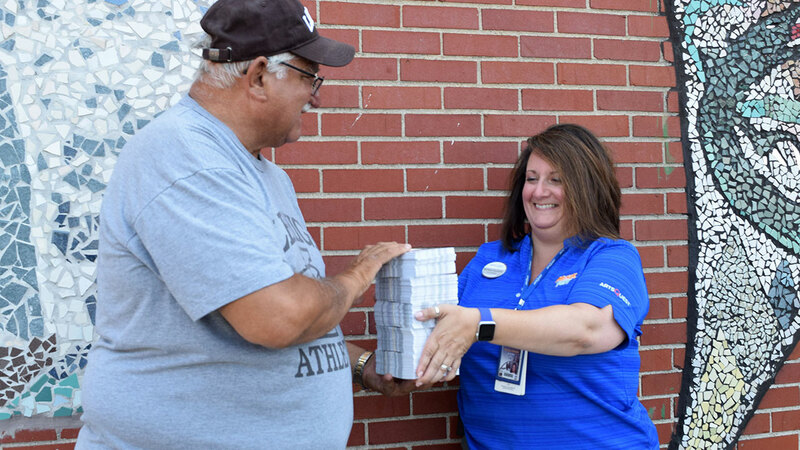 The tickets will be used to keep police, fire, health and emergency response personnel well hydrated as they continue the clean-up efforts following the flooding that temporarily closed three of the festival's venues. "Once we heard about the incredible efforts of the city's emergency services personnel, we knew we needed to do something to support these men and women, many of whom have been working nonstop since yesterday," Stocklas said. Wade Haubert Jr., Deputy Director of Emergency Management for the city, says the generous donation is greatly appreciated by everyone working on the cleanup efforts. "These food & beverage tickets will help us to ensure our many employees on site remain hydrated, allowing them to continue the important task of getting Musikfest's Handwerkplatz and Familienplatz venues back up and operational as soon as possible," Haubert said. ArtsQuest's Chief Operating Officer, Curt Mosel, says Stocklas and Bartakovits are just another example of the incredible support the community has for Musikfest. "Since 1984, this festival has received tremendous backing from our community, from the 1,500 volunteers and 160 corporate partners who lend a hand, to the many patrons who attend the festival," Mosel said. "Every time we've had a major issue such as flooding, we've seen our community rally around us to help us keep the festival going. We thank Jim and Barry for taking a lead role in supporting our city services during this challenging time." All of the venues were finally reopened on Sunday. The 35th annual MusikFest continues through August 12th.